A combination of scheduled maintenance, inspections, and advanced connectivity can help keep fleets in working order. Wear and tear is inevitable, but proactively managing the condition of vehicles improves longevity and reduces time spent in the shop. Here are four ways fleet managers and drivers can maximize uptime. Over-the-air engine parameter changes and Detroit Diesel Engine Control (DDEC) report extractions are now available exclusively in the new Freightliner Cascadia when spec’d with Detroit engines. This eliminates the need for vehicles to stop and physically connect at a shop or service center, keeping your trucks on the road. Remote Updates also allow fleet owners to modify engine parameters on an unlimited number of trucks, so you can update your entire fleet at the same time. Performing routine maintenance on your truck is the best way to prevent major failures. This includes checking your oil and oil filter, radiator, tire pressure, fuel vent, and brakes. Scheduled maintenance can also reduce costs associated with serious issues by catching them early. According to the Federal Motor Carrier Safety Administration (FMCSA), Section 392.7, pre-tip vehicle inspections should be conducted before each trip begins and after every rest period. These can help prevent unnecessary stops while on the road and limit safety risks to drivers. The following should be checked in each inspection: service brakes on truck and trailer, parking brake, steering mechanism, lighting devices and reflectors, tires, wheels, rims, horn, windshield wipers, rear-vision mirrors, coupling devices, and emergency equipment. 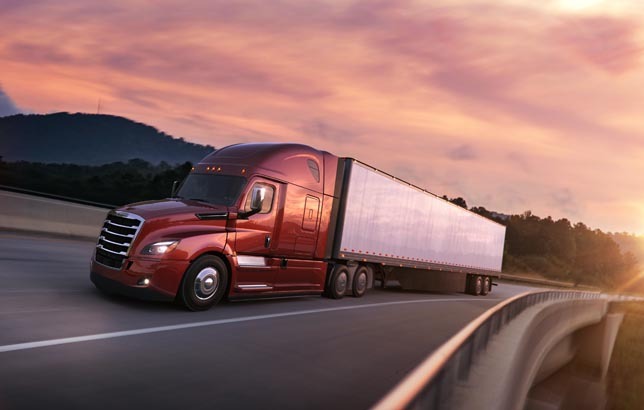 The new Freightliner Cascadia has an optional Exterior Bulb Pre-Trip Inspection System that allows drivers to quickly check all of their exterior lights with the flip of a switch. Little details like this help drivers catch issues in the lot or at a truck stop, rather than 100 miles into a trip on a long stretch of empty highway. The trouble with check engine lights is that they’re vague. They can signal anything from an easy fix to a critical engine failure, so it’s hard for drivers to know what to do. With Virtual Technician, available on Freightliner Trucks with Detroit engines, fleets are notified within minutes of a check engine light about the severity of the issue, which puts an end to the guessing game. For critical fault events a data capture is taken immediately before, during and after the fault occurs, and sent to the experts at the Customer Support Center in Detroit for analysis and recommendations. This way, issues are caught as soon as they happen and drivers know whether they need to pull over to prevent the issue from getting worse or if they can continue on their trip without worry of a breakdown. This limits downtime and helps keep fleets on schedule.